hook, yrh and draw through all loops. Round 3 - 2ch, 1htr into each htr to end, ss to top of 2ch. DNT. (41htr + 2ch). Fasten off. Round 5 - Working through both loops make 1ch, 1dc into base of 1ch, 1dc into each dc to end, ss to first dc. Turn (42dc). Rpt last row once. Round 7 (Shape Heel & Instep) - 3ch, 1tr into each of next 2dc, 1htr into each of next 2dc, 1dc into each of next 7dc, dec 1dc over next 2dc, (see abbrev above) nine times, 1dc into each of next 7dc, 1htr into each of next 2dc, 1tr into each of next 3dc, ss to top of 3ch on beginning of row. Turn. Round 8 - 3ch, 1tr into each of next 3tr, 1htr into each of next 2htr, 1dc into each of next 7dc, dec 1dc over next 2dc (twice), 1dc into next dc, dec 1dc over next 2dc (twice), 1dc into each of next 7dc, 1htr into each of next 2htr, 1tr into each of next 2tr, ss to top of 3ch. Fasten off. With 4.50mm hook and top of shoe towards you, rejoin colour 1 to back seam, work a ss into each loose loop around sole of shoe to end, ss to first ss on beginning of row. Fasten off. Finishing - Weave in ends, sew a button on side of each shoe to correspond with 6 chain loop and fasten through the loop, attach a decorative button to front of each shoe. 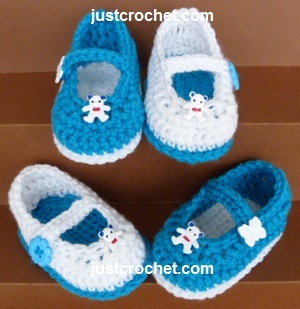 Hope you enjoy this free crochet pattern for Mary-Jane Shoes.